NASA is gearing up for this week's launch of twin lunar orbiters built to map the gravity of Earth's moon in unprecedented detail. The twin GRAILl lunar probes are slated to blast off from Florida's Cape Canaveral Air Force Station on Thursday (Sept. 8). The mission has two instantaneous (one-second) launch windows on that date, one at 8:37 a.m. EDT and another at 9:16 a.m. EDT (1237 and 1316 GMT), NASA officials said. 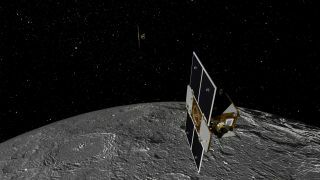 The two unmanned spacecraft should reach the moon around New Year's Day, at which point they'll begin probing the moon's composition from crust to core. GRAIL's observations should help scientists better understand how the moon formed and evolved, researchers said. Once launched, the twin probes will embark on a circuitous, 3 1/2-month trip to the moon via the sun-Earth Lagrange Point 1, a gravitationally stable spot between our planet and the sun. This route is energy-efficient and thus helps keep the $496 million mission's costs down, researchers said. They'll essentially chase each around the moon, keeping close tabs on the distance between them. This distance will change slightly as they travel, owing to regional differences in the moon's gravitational field. By analyzing these distance variations, researchers will be able to determine the lunar gravity field in great detail. And this information, in turn, will yield insights into the moon's structure and evolutionary history. Knowing how the moon formed and changed over billions of years should also give scientists a better understanding of the inner solar system's other big, rocky bodies — Mercury, Venus, Earth and Mars — researchers said. NASA personnel won't be the only ones who get to watch GRAIL launch on Sept. 8. The space agency has invited 150 of its Twitter followers to the event as well. These lucky 150, selected from more than 800 people who registered, will be treated to a two-day event that culminates with GRAIL's launch aboard a Delta 2 rocket on Sept. 8. They will share their experiences, in short bursts of 140 characters or less. If the launch doesn't go off on Sept. 8, GRAIL will have plenty of other chances. The mission's launch period lasts until Oct. 19.